Electricity is used more than any other source of energy in the United States. Just about everything we use every day is powered by electricity...our stoves, microwave ovens, lamps, stereos, and televisions, just to name a few. RP&L takes pride in delivering reliable and quality power to the city of Richmond. We also want our customers to understand how electric usage is measured and what can affect their usage. Amp: Short for "ampere," a unit of electric current. Circuit: The path an electric current flows. Fuse: A device that contains an element that protects the electric current by melting when overloaded. Kilowatt: One-thousand watts of power. Meterbase: The enclosure, usually mounted on a wall of the dwelling, which hold the watt-hour meter. Volt: A unit of electrical potential. The higher the voltage, the greater the electric power. Watt: A unit of electrical power. For example, the higher the wattage of a light bulb, the brighter the light. Electric meters are extremely accurate recording devices. All meters must pass rigid testing before RP&L's Meter Department will install them, and during routine or periodic testing. Many of the displays on our meters appear to "flash" from the reading to a display of 88888. This is normal and insures the reading on your display is accurate. When your electric bill seems high, keep in mind the possibility that you might have a greater number of days included in this bill, or that you are comparing it to a previous bill where the weather conditions were not similar. It would always be better to compare your bill with the same month last year instead of comparing it to your last month's bill because of the changes in temperature. If, after considering these factors, your bill still seems too high, we would be happy to speak with you about some other possibilities. Please feel free to call our meter department at 765-973-7243. RP&L places high importance on reading your meter correctly. Our billing calculation allows for a window in which the reading "should" fall. In other words, we have an idea of what your reading is most likely going to be, therefore, allowing us a method of catching errors before your bill is printed. When a reading falls outside this window, either higher or lower than what seems normal, then the address appears on a report. From this report, a meter reader will return to the address to double-check the reading and make any necessary adjustments before you receive your monthly bill. 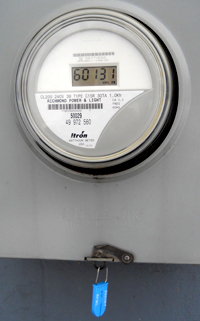 The majority of residential meters are read daily through RP&L’s automated system. This reduces the chance the reading could be incorrect from human error and eliminates an estimated reading due to inclement weather or inability to gain access to the meter. Our meter readers still need access to the meter for visual inspections to insure there are no safety or hazardous conditions with the meter, meterbase, or incoming power lines. Therefore it’s important if you put up new fences, locked gates, or locked back porches that you allow access to the meter. This can be done by having an extra key that can be given to us so we can gain access without having to bother you. All keys are kept in a vault and are only taken out when needing access to your meter. It’s also important to not allow weeds, vines, or decorative items to block access to your meter at any time. The meter readers will also not enter an area that has a dog, so they may make arrangements to have the dog brought inside or a placed in a different area to do their inspection. Your electric meter measures the amount of electricity you use. Just as you purchase pounds of meat, quarts of milk, or gallons of gasoline you buy kilowatt hours (kWh). Our meters display 5 digits. A display of 10250 would represent 10,250 kWh. If you checked the meter 24 hours later and found a display of 10312, these would indicate that 62 kWh usage over that time period. 1. Record your first reading. 2. Record your second reading at a predetermined time. This could be a 24 hours, a week, or month later. 3. Subtract your first reading from the second to determine kilowatt usage. 4. Multiply the number of kilowatts by .09 dollars for an approximate cost of electricity over that time period. Richmond Power & Light's residential customers pay an average of nine cents per kilowatt hour (Kwh) of electricity. This includes taxes, facilities charge, and fees. Your average cost per kilowatt hour will probably be a little bit different, depending on the total number of kilowatt hours you use each month. The more electricity you use, the less you pay per kilowatt hour. During the winter if some type of electric heat is used, this will usually have a significant impact on your usage. During the summer if a central or window air conditioner is used, this will also have a significant impact on your usage. An electric water heater can increase the amount of usage. Factors such as the water heater’s temperature setting, the number of showers or laundry loads, and the age of the unit will affect the usage. Then comes major appliances such as, dryers, stoves, washers, and refrigerators. To calculate the approximate usage for any device you must first know it's rating in watts. A typical space heater has a name plate that says on it somewhere 1500 Watts. Then you have to know about how many hours it will run per day, let's say 8 hours per day. KWH = (Watts / 1000) x Hours per day x 31 days per month. Cost = KWH x $0.09 = approximate monthly cost. 372 x .09 = $33.48 per month. You can use the formula above to calculate the approximate cost for any electrical appliance once you find its rating in watts and know approximately how many hours it will run per day. Please contact RP&L if you notice cracked or broken meters. Remember that the meterbase contains voltage that can cause a fire, explosion, or shock and only a RP&L representative can open your meterbase and remove your meter. If you need to have electrical work done RP&L will remove your meter at no charge so work can be done safely. When RP&L installs the meter there is a colored seal that we attach to the meterbase. It’s important that this seal remains intact and not cut. If you see your seal is cut or missing please call RP&L so we can come out in inspect the meter and meterbase for any safety or hazardous conditions.